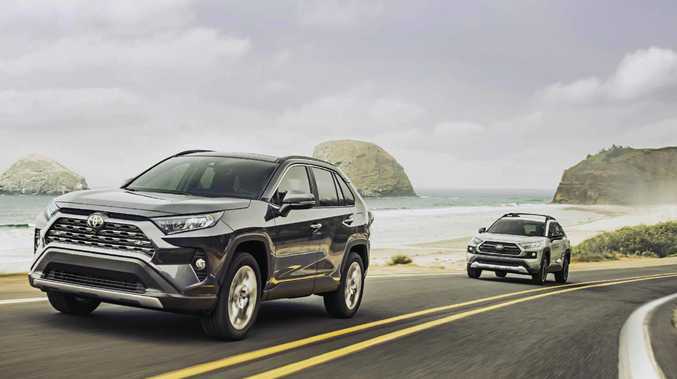 The new Toyota RAV4 arrives in Australia March, 2019. A HYBRID all-wheel drive will headline the arrival of the fifth-generation Toyota RAV4 when it lands in Australia after March next year. The hybrid will be Toyota's first petrol-electric SUV and will be sold in front and all-wheel-drive guises, with the AWD version fitted with an extra electric motor on the rear axle capable of sending up to 80 per cent of torque to the rear wheels. It will also use a limited slip diff to maximise grip on and off-the road by transferring torque to the wheel with the most traction if it detects slip. Toyota says the hybrid's electric AWD is more compact and fuel-efficient than the mechanical AWD that underpins the 2.5-litre petrol variant, which will rely on Toyota's first application of torque-vectoring in place of the hybrid's LSD. Toyota has finally added a hybrid version to the RAV4 lineup. The petrol AWD will also have "multi-terrain" drive modes, with the option to select between "mud and sand" and "rock and dirt" when off-road. On the highway, it will drive only the front wheels to lower fuel use. Combined outputs from the hybrid's 2.5-litre engine and electric motor will be 155kW. Toyota hasn't released combined torque but says the petrol engine delivers 221Nm. The company is persisting with the cheaper but less energy-dense nickel-metal hybrid battery pack, which will be mounted under the rear seat to avoid losing luggage space. Toyota still doesn’t use a lithium-ion battery. 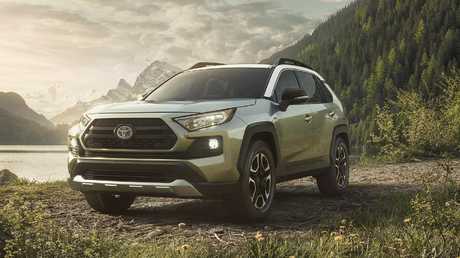 The "fleet special" front-wheel-drive RAV4 will use a new direct-injection 2.0-litre petrol engine with 127kW/203Nm, matched to either a six-speed manual or continuously variable transmission. A retuned version of the hybrid's 2.5-litre engine will be exclusively paired with a mechanical AWD set-up capable of sending up to 50 per cent of torque to the back tyres and is rated at 152kW/243Nm. Toyota says that's a power bump of 15 per cent over the current 2.5 litre engine, while torque is up by a more modest 4 per cent. This version will use a new eight-speed automatic transmission. The new RAV4 is a cornerstone vehicle for Toyota, with more than 300,000 sales in Australia, headlined by 20,000 sales last year. The booming SUV market means Toyota will break that record in 2018, having already sold 18,500 vehicles to date. 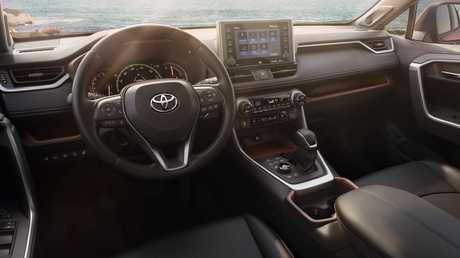 The current RAV4 is one of the best selling SUVs in the country. The new version rides on a wheelbase that's 30mm longer than before, liberating extra cabin space. The other key dimensions see the SUV grow by 5mm in length and 10mm in width, though height is down by 10mm. Smartphone mirroring won't be available on Australian RAV4s. Australia's vice president sales and marketing Sean Hanley says the new drivelines and AWD systems will deliver enhanced performance, capability and control. Three grilles are available on the US-spec cars and Hanley won't confirm if we'll get all three but News Corp expects the pick-up inspired double-slate grille to be fitted on the 2.5-litre AWD. 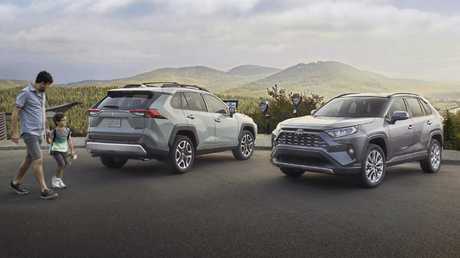 "The RAV4 looks tough … and tough SUVs are the future but they will have to have refinement and interior luxury," Hanley says.